I'm looking back a little way here. I always meant to buy this book but somehow never got around to it, but spotted it in the library the other day and had to bring it home. I adore the illustration work of Freya Blackwood, she is in my top 10 list of favourite illustrators. Somehow she just manages to capture the special individuality of her characters, be they a dog and a chicken, or a child, or even a home. They are somehow filled with warmth and life when Freya draws them. Banjo is a farm dog. Each day he rounds the chickens up so they get back into their enclosure, safe and sound for the night. When he barks they jump and fly to their roosts. But not Ruby Red. She just ignores him until he makes a jump for her then she's off up into the air and down where she's meant to be. But one day Ruby isn't there. Banjo goes searching. There is probably a tear in your eye when he finds her lying on the ground 'lying still, her feathers flat, her eyes closed'. But this is not the end, the end is warm, and unexpected, and just right. But I'm not going to tell you how it ends, you'll have to read it to find out. 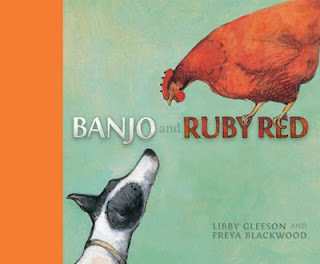 Look for more books illustrated by Freya Blackwood too, she's a treasure, and there are others where she's worked with the fabulous Libby Gleeson too. A few months ago I reviewed their book Cleo's Stories for Family Times, a lovely set of stories about an ordinary sort of little girl called Cleo, which I really loved, and you can spend absolutely ages getting lost in Freya's website.